Still searching for that perfect Wedding venue? Having trouble narrowing it down? –Will there be shade or overhead protection from the hot sun or rain? Outdoors sounds lovely, and photos can look great. Just make sure there is a backup plan on site! A tent or canopy can offer relief from the sun and nicely defines your Reception area. 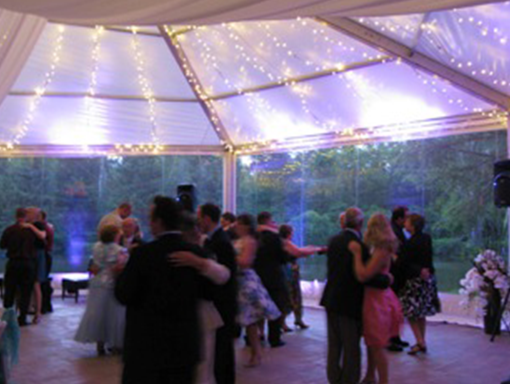 The Reception tent can often double for the Ceremony is necessary. A good Wedding Planning team will quickly move into action to set up your Ceremony in the tent and then reorganize for the Reception. –Cleanup the next day? Outdoor Weddings are awesome as they provide extra space outside the tent – the grounds are available for guests to explore. The problem is that your guests may do more than explore – they can sometimes make a huge mess and distribute it evenly around the grounds -Your rented glassware may disappear– make sure you know who is responsible for cleanup and seek and find – your security deposit may get used up in this area! –Parking issues — many outdoor venues do not have adequate parking facilities –if this is the case — you may have to plan ahead and get permission to use a local parking lot that day and shuttle your guests back and forth to the venue. So you may be thinking — I do not want to worry about all this sort of thing! Simplify your life, look forward to a stress free Wedding day and keep your family relaxed – hire a Wedding Planner or Coordinator. Give us a call today for your complimentary consultation — we can also help you stay within budget.